Spend an Afternoon in Sicily on September 9, 2018! Please join many friends of Our Lady of Perpetual Help Catholic Church on Sunday, September 9, 2018, from 11:00 to 4:00 for An Afternoon in Sicily! 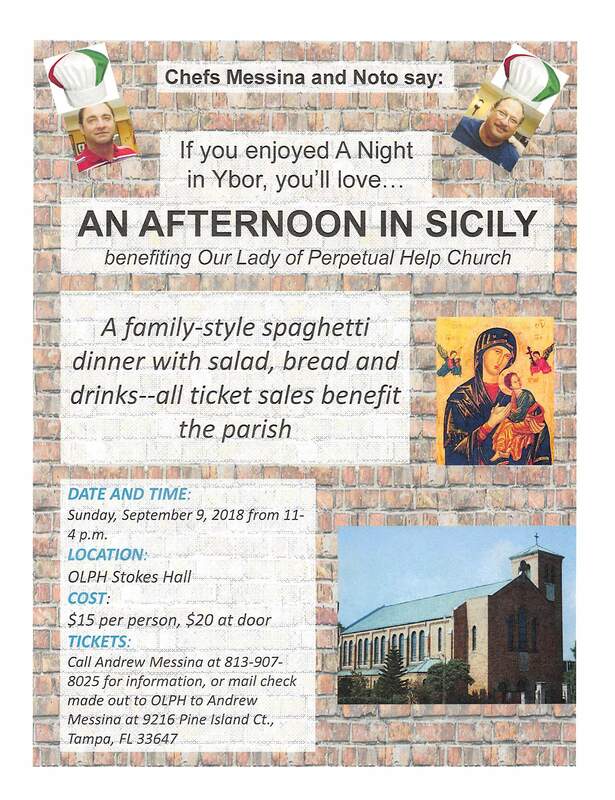 A family-style spaghetti dinner and fellowship will be the hallmarks of this food event being held for the benefit of OLPH. Advanced tickets ($15) may be purchased after all weekend masses in August or by sending a check, made out to OLPH, to event coordinator Andrew Messina at 9216 Pine Island Court, Tampa, 33647. Day of event tickets may be purchased at the door for $20.